Seth may appreciate this, or maybe not. Seth has been interested in doing a "Mission to Mars" based game, with somewhat realistic-based theme-ing, based on current scientific theoretical planning. However, as he described it more, to me, it became just another in a long line of M.U.L.E. like resource generative games: put a mining unit on mars, let it mine for minerals to make more stuff, which then let's you mine different stuff, etc. etc. The thing that struck me of being interesting about scientific-based theme is dealing with the amount of time it takes to get stuff across great distances, and the general precise of doing space travel stuff. Additionally, as President George Bush found out when he made an announcement about plans to go to Mars, it is technologically feasible to do it; but it's mostly about the political will power to be able to push through a plan of such large scope and money drain, with no obvious payback to the American public within a lifetime. At least in the case for the race for space in the 60s, it was sold to the public partly as a race against the evil communists, as a way to prove American know-how can beat the evil empire. Currently, I don't think that anyone is remotely close to Mars. Anyway, so the game I proposed was not about resource management, or pick up and delivery back and forth between Earth and Mars, but primarily about controlling political clout, and the timing of various modules to Mars, based on the long term plans within the Case For Mars. Simply enough, the game, as shown above, works like this. The sheet with the yellow pawn abstracts out the "public's interest" in the Mars program. The higher the interest, the more actions, or "political clout" you have. As most things with the public eye, interest wanes over time, giving you less clout to spend on the issue, until an important milestone is hit (say, a man walking on Mars), which increases the awareness in the program, and therefor, giving you more clout to spend. So, the top row of cards are event cards that randomly indicate how much interest wanes on a turn. This would represent various newsworthy things that the news cycle and the public replaces their interest with. Things like scandal, wars, economy, etc. As a country figurehead, you can control this somewhat, by spending your clout to adjust the events; "it looks like there's a war brewing, we better put a stop to that." Of course, this is clout that you can't spend towards your mission to mars. The bottom row represents cargo ships delivering modules to Mars. Larger ships are launched with more clout; and emptier ships move faster than full ships. Eventually, the modules are dropped off on mars (to the right of the picture, where the cubes are stacked). Certain modules don't "work" without previous modules being on Mars, and some modules eventually expire if they don't have humans, and habitat modules, powering them within a few turns after their arrival. And so, the game pretty much plays where you are watching your clout and interest in the project dwindle, then a milestone is hit, and you got clout again. For a first pass, it's an interesting play; but right now the game needs to be a bit tighter to be interesting I think. I'm probably being way too generous with starting clout; it really needs to feel like you are racing between hitting the next milestone and hitting rock bottom on your public interest to be fun. Not that I'm obsessed or anything, but I've decided to actually finish the Shipwreck game, instead of letting it linger for other exploratory designs. Unfortunately, it's a hard game to prototype; and through various machinery of my free will and accidental programming, finishing the prototype is turning out to be a nerve racking affair, with a lot of wasted "sticky-back" printer paper. The game includes 120 small cards which need to be on thick, chipboard-style cardboard, and I'm using illustrator board for it. These cards either contain data point clues, or cards with windows that reveal specific clues when placed over the first set of cards. Unfortunately, after mounting and cutting, it turns out that my program was "building" the cards wrong, which entailed another set of printed cards. After which, I noticed that some of my data entry was wrong, which entailed another change, reprint, and mount. Then, when I thought I was finished, I came to another, better conclusion to how the game should be constructed, which required another set. But I think I finally have it right now. The next problem which I think I have solved is the way the clues are recorded for the player on the data sheet. 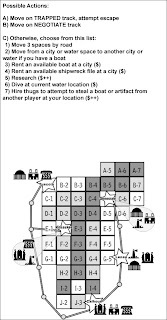 Back when it was simply "fishin' for 'recks," I just had a data sheet with a copy of the map, and a player could mark up multiple maps for each wreck he was currently involved in hunting for. It worked, but I wasn't happy with it, and I never could come up with a better solution. However, with the new DaVinci Code-styling of the game, which involves three different "stages" of hunting and piecing together clues each with it's own slightly different approach of clue gathering, the simple map marking technique won't work. And so I've come up with a two sheet solution. 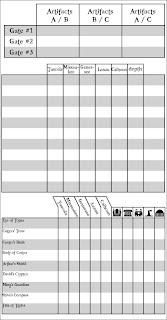 The first sheet to the left here is a data grid for each of the three stages, cross-referencing the important information that is gleaned from clues. The top part is the ultimate goal of finding a gate. This is done by combining artifact cards (of which there are three types, A,B, and C). Each set of artifacts reveal a clue data point to the location of a gate. Two or three of these data points will reveal the gate location. The middle part is for shipwreck searching. Shipwrecks are located by directional vectors from each of the five cities, plus a depth rating. By triangulating enough of these data points, you can find a shipwreck. And the bottom part is for locating which shipwreck an artifact is on. Each city has a different combination of buildings. And researching an artifact in a city will reveal that shipwreck, or give you a building of the city that can reveal the shipwreck's name. Page two over here on the left is a simple representation of the map and the important data points for triangulating the clues, and a list of actions the player can take. By folding page two (the map page) in half inward, a player can create a "cover" in order to keep page 1 secret (also folded in half). Page 1 is folded outward, so that the data grids are on "both sides" of the half-sized page of paper, and allows for easy flip access to both halves, and easy cross-referencing of the data grid to the map. Of course, the map can also be used for taking notes. At least, in theory, this all seems to work well. 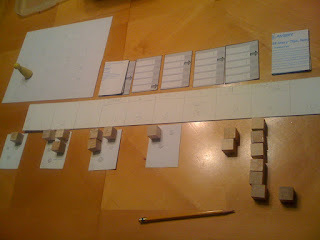 It's up to the unforgiving world of playtesting to see if actually unfolds as well as it does in my mind.